Our bags had just been unpacked, the impressions from our most recent trip to Nice not fully digested (no pun intended) and yet it was time to leave again. Italy this time, Campania to be more specific. A destination we didn’t have on our radar until late summer – but more on this later. We had never been to this region of Italy before, so we quickly decided to throw in an extra day in Naples as a short stop-over. Just enough time to get a glimpse of the city, take a deep breath of the historic district, enjoy some typical Neapolitan food and find out first hand, whether or not the city is as intimidating as media sometimes portraits or an enchanting experience. Because everybody keeps asking this about Naples: no, we didn’t perceive it more or less dangerous than any other larger city that we’ve been to. Of course, you should apply a pinch of common sense and you’ll be fine. However, if you have been to other famous Italian cities like Rome, Venice, Florence, the rough and a little chaotic city in the shadows of Mt. Vesuvius might not charm you on first sight. 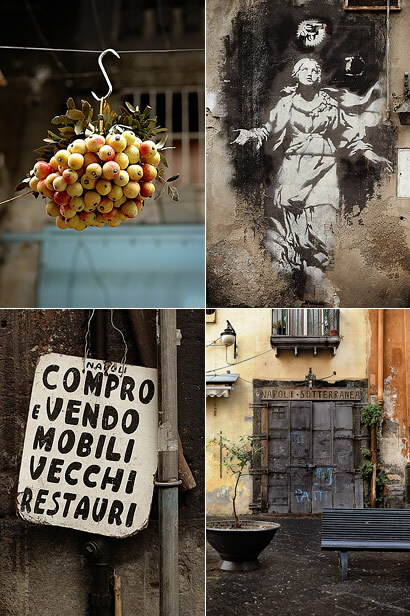 But even with the occasional rain-shower that we experienced on our first afternoon, strolling through the narrow, cobblestoned streets and alleys – never short of a surprise-by-speeding-by-scooter-action – we found Naples to be both photogenic and intriguing. At times a bit frenetic and tricky to navigate, our walking pace was very much dictated by the obsessive compulsive desire to checking out each and every pasticceria or pizzeria, left and right. But first things first, our short-term accommodation of choice turned out to be an extremely appealing, family-run hotel, conveniently located in a quiet corner of the historic district. Just minutes after checking in we were on a mission to Via dei Tribulani, where most of our collected recommendations for typical Neapolitan pizza were beaded like on a string. Di Matteo, I Decumani, Sorbillo and what not, we had a hard time choosing where to go. In the end, it was a small shopping-related shortcut, that led us straight to the corner of Di Matteo. Well nurtured men in white tees were busy baking and frying pizza and before we knew it, we were forwarded to a small and very authentic room (with no frills, think plastic and such), where we ordered our pizze (Margharita and Bufala), in pure disbelief over the prices on the wall (our two pizze were less than 10 EUR). The moment they arrived, we immediately canceled our pizzaria-hopping plans – for personal pizza studies only, of course – these babies were anything but small. With a bit of sunshine the next morning the city looked even more inviting and we tried different places for babà and sfogliatella, but couldn’t decide on a favorite. Then faith – again – led us to Di Matteo, where we devoured my personal favorite of our short stint in Naples, their fried pizza filled with ricotta. Never have greasy fingers been earned that well! A hilarious, older cab driver who introduced himself as Gennaro quickly became our friend (another story) and brought us to the station where we met with Matt & Adam, Keiko and Chika & Andrew – one of our most memorable weekends in food was about to begin. We just didn’t have a clue. To be continued. 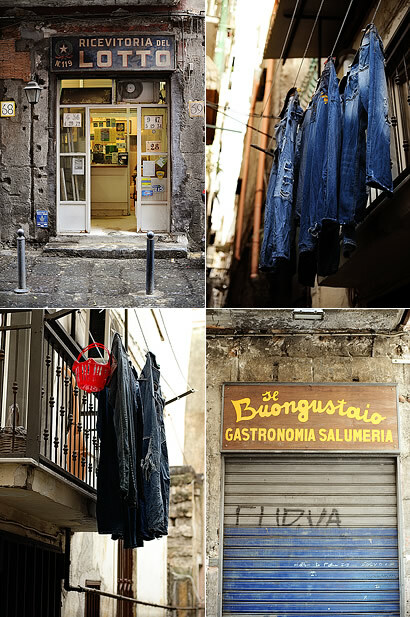 What beautiful photos of Naples! Such amazing colors and textures! Amazing Pictures as always! Great to visit this City with your eyes! PS: Would you mind doing your links to the Sites you wanna show as "open new Tab"-Links? It is too bad leaving your page just because I do wanna have look on your recommended pages. Thanks!! You are so fortunate, I went to Naples last year and was absolutely amazed. I felt like it was a forgotten city where every nook and cranny holds an untold secret. It was also bustling with energy and almost felt lawless, truly a stupendous experience. Did you get a chance to get a frittattina at L.U.I.S.E? I wish I had known you were coming down - I was just in Naples 2 weekends ago! Would have been nice to meet you (I just started posting some pics about my trip, too!) Di Matteo was very good and the prices were unbelievable! Stupende foto! Sorry for the use of Italian. Your pictures are able to catch up a Naples lost in the '50s and in movies of many many years ago. You gave an old charme to Naple life with a modern eye. 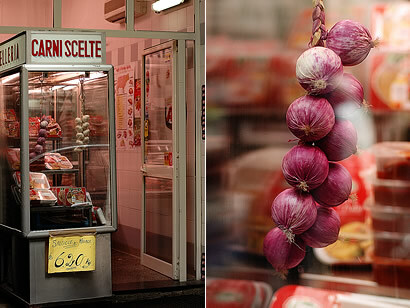 I read that Naples Italy is one of the food havens for any foodaholic :) Is it true? Oh wow, what lovely pictures. 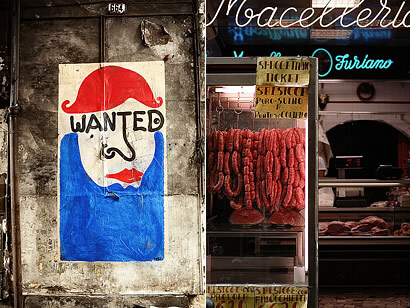 Having been to Naples twice, my heart beats faster when I look at your photography. Great job! Oh, then welcome to the land of amazing and delicious food. I am Vietnamese but living in Italy, my aunt in law is from Naples. I was lucky to have opportunity to taste napoli food. So yummy! since you are there, it is a MUST to try realy pizza, and the fantastic Mozarella. I assure that it is unforgettable!! I am planning to go there this December. It is so nice to learn some experience from you trip. PS: Though Naple is famous for scandal of Mafia but dont worry, it is still very safe, and the locals are very famous for their friendly and hospitable attitude! Enjoy your trip!! Great pictures! Can't wait to read more about this trip. Thanks for sharing your memories! I had to go to Naples about 5 years ago for work. I really wish I'd more time to tour around - Pompeii, Vesuvius, the city itself - and more of that great pizza. At a road-side restaurant near my hotel I had one of the best pizzas I've ever eaten. They called it the Vesuvius: it had a crust on top that bulged up in the middle like a volcano! Images like artwork - gorgeous! Spent about a week in Naples a couple of years ago as part of a two week trip to Campania. Great city, went about this time of year and for the locals it was cold (they had on sweaters and down vests). I was sweltering and trying not to look like a tourist. Fresh almost warm sfogliattas with espresso first thing in the morning outside one of the markets. Ah, the memories. Highly recommend touring Campania as well. danke, nicky. grazie di cuoe. beim anblick der fotos geht mir mein kleines herzchen auf. und wenn ich mir vorstelle, was du alles gerochen, gegessen, genossen hast...da platz' ich fast vor melancholie. I was just in Naples this August and found it just as you did - not as "pretty" as say Florence or Rome, but so vibrant in all its chaos. Your photos are gorgeous - I am so glad to have found your blog!